‘Is Herr Flick still the manager here?’ asks Lorraine. Bob and Lorraine are long standing friends of mine – we first met in the Youth Group at Greenford Baptist Church in the late 1950s – and they have come to visit us for the day at our campsite near Bayonne. They have a house near Saint Jean de Luz but have actually stayed on our campsite about 5 years ago. Julia and I fall about laughing because the manager of our campsite is in fact the spitting image of ‘Herr Otto Flick’ – one of the main characters in the highly popular British sitcom ’Allo ’Allo! broadcast on BBC TV from 1982-1992 and still repeated today. René is also trying to keep his affairs with his waitresses secret from his wife, Edith (who regularly sings in the café, despite being an appallingly bad singer, which she does not realise). In addition, the Communist Resistance is plotting against René for serving Germans and for working with the Gaullist Resistance. Ironically, the Communist Resistance only blow things up for money. The only reason they do not shoot René is that their leader is in love with him, a fact he has to hide from both his wife and the waitresses. Furthermore, the seemingly gay German Lieutenant Gruber is also continually flirting with René and finding him in embarrassing situations. These situations are made even more humorous by the fact that René is not exactly the best-looking man in France, is hardly a hero, and is often forced by his wife to do missions and secret operations. The problem is, that the manager on our campsite does indeed look exactly like ‘Herr Flick’ in the TV series … although his wife it has to be said looks nothing like ‘Helga’?! Nevertheless, they soon become known all over the campsite as ‘Herr Flick’ and ‘Helga’. The added problem is that the campsite ‘Herr Flick’ has a tendency to behave like the original ‘Herr Flick’ in the TV series. ‘Helga’ does all the work in the campsite office – booking people in, taking care of all the admin, sorting out the various problems that occur daily … whilst ‘Herr Flick’ bombs around the site on his electric ‘Go Kart’ making sure that all the rules are obeyed. In the day time he tours the entire site making sure that none of us have hung illegal washing lines between the trees, and he repeats the process at 10.00 p.m. every evening telling everyone to be quiet. He escorts new campers to their allocated pitches but never stops to wish them a good stay or iron out any problems they may have with their pitches … he just jabs a finger at the pitch in question … and zooms on. His favourite past-time, however, is tackling males in the swimming pool who are wearing ‘Bermuda shorts’ and not the regulation skimpy French Lycra shorts. It is noticeable, however, that he picks on young people and small people, and never challenges the 6 foot plus Brits or Dutch guys?! It has all got even more entertaining of late with the arrival of ‘Herr Flick’s’ mother – who is the spitting image of René’s mother-in-law, Madame Fanny La Fan, in the TV series. In the TV series Madam Fanny La Fan is partial to a drop of gin, and here on our campsite ‘Herr Flick’s’ mother is partial to drop or two of wine. The campsite office closes on the dot at 12 noon and doesn’t open again until 3.00 p.m. ‘Herr Flick’, ‘Helga’ and ‘Madam Fanny’ have an extended lunch break in the campsite café as a result. 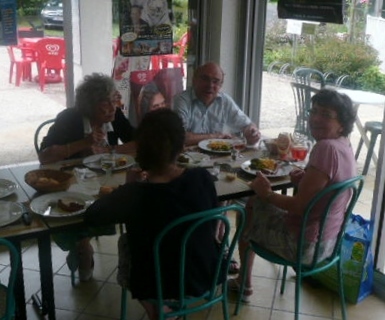 Everything has to stop when they arrive for lunch – whoever the café staff are serving at the time have to wait whilst these three are served – although sometimes it is hard work dragging ‘Madam Fanny’ off her stool at the bar (where she can reach the bottle of wine) to the table for her lunch. It is even more traumatic every evening around 7.00 p.m. when the whole process is repeated for dinner … and it is even more difficult for ‘Herr Flick’ and ‘Helga’ to get ‘Madam Fanny’ off her bar stool?! At 3.00 p.m. we all make sure that our cars are well off the campsite roads. Fortified and revived by a good several course French lunch, together with a bottle or two of good French wine, ‘Herr Flick’ and ‘Helga’ are off on a postprandial tour of the campsite on their electric ‘Go Karts’. ‘Helga’ flies around the corners at top speed evidently enjoying the freedom from the office, her husband, and her mother-in-law?! ‘Herr Flick’ flies around the campsite with his mother sitting in the passenger seat and hanging on for dear life. Has he got ‘Madam Fanny’ insured for a lot of money we wonder? I have a lot of sympathy for ‘Herr Flick’ and ‘Helga’. It must be a soul-destroying job running a campsite like this … almost as difficult as being a Baptist Minister? The managers do their best: the campsite is very nicely kept, the showers are efficient with plenty of hot water, and the toilets are clean. There may be a few imperfections – the cost of the internet and its ineffectiveness at times – but on the whole this is the best kept campsite we have been to so far. Most of the campers are helpful and considerate but there are always a few who are never happy … just like the local church. One can’t help but feel that the whole thing has taken its toll on the managers, however. ‘Helga’ seems very tired at times … and ‘Herr Flick’ obviously gets very angry with those who don’t ‘obey the rules’. I understand how he feels, but really shouting at people gets you nowhere. Reflecting on this, I can’t help but feel that there are too many ‘shouty people’ in the world … and in the church for that matter?! I recall reading about some sermon notes that the cleaner found in the pulpit of a certain church on the Monday following the previous Sunday. At one particular point in the sermon there was a note written in the margin – ‘Argument weak, shout loud!’. When we end up shouting at people – in life, from the pulpit, in church, in trying to get the Gospel across – we have lost it! The Gospel is ‘good news of great joy’ (Luke 2:10). We are not ‘moralists’ or ‘legalists’ – there to condemn people – but sharers of a great story that brings hope to the hopeless. We are to ‘speak the truth in love’ (Ephesians 4:15), not shout at people, leave alone condemn people out of hand?! ‘Madam Fanny’ must be well into her 80s I guess. When she first arrived she completely ignored me? Her son completely ignores Julia … I think he ignores all women … so we presumed it ran in the family? Of late, however, ‘Madam Fanny’ has been giving me ‘the eye’ …in fact she seems to have taken a bit of a shine to me? She even attempts to strike up conversations with me? Of course it is obviously my likeness to George Clooney (apart from the fact that I am a foot taller than him) that is making her so eloquent … well either that or the wine? !